In our previous post, we have discussed how to backup and restore tally company and now here you’ll find a step by step guide on how to Import and Export Tally data from one company to another company. Import/Export is one of the important feature of Tally which saves a lot of time of the users. You can easily transfer Ledgers, Stock Items, Godowns, Cost Centres and Cost Categories, Transactions/Voucher Entries and everything else from one company to another company. Tally also allows you to Export all data at a time from one company and Import to another company. Go through this page to find a simple tutorial on how to Import Export Tally Data. In Tally, whenever a new company created, by default you’ll find two Ledgers- Cash and Profit and Loss, rest of the ledgers you have to create according to your need. Most of the ledgers are common for each company such as- Sales, Purchases, Salary, Rent, and many more. So, why wasting time by creating those ledgers in a new company while we have already created those ledgers to another company, just import those ledgers from there. Like wise you can import Stock Items, Stock Units, Godowns and even Voucher entries can be import from another company. 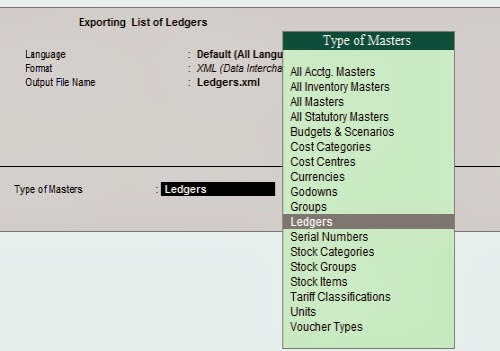 There are two ways in Tally to Import data from another company, one is using the Import and Export Menu Option and another is directly transfer data from one company to another. In this article we will show the Import and Export Menu option to transfer data from one company to another. Follow the tutorial below. Important Note: The tutorial is based on the Tally.ERP9 but should work with other versions of Tally. For tutorial purpose, we recommend you to import data to a newly created company where no important data is stored, else you may loss your company data. First open Tally, go to the Company Info Menu (Alt+F3)- Select Company and open the company from where you want to import data. 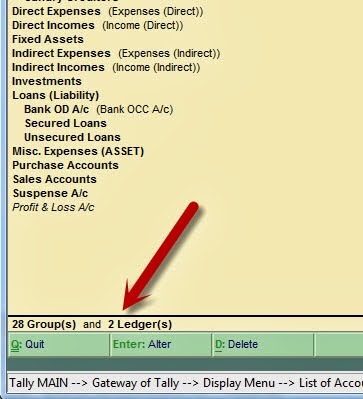 Now, go to the Gateway of Tally- Display- List of Accounts and check how many Ledgers are there at the bottom of the screen. See the image below. Press Enter to accept the Export confirmation message, all the ledgers will be Export and stored in a file name Ledgers.xml. The Exported file is saved under the Tally main folder. Now, open a newly created company and check how many Ledgers are there from Gateway of Tally- Display- List of Accounts. Here you can see only 2 Ledgers are there. Note: while importing ledgers to a fresh company, then select any of the option from the list. 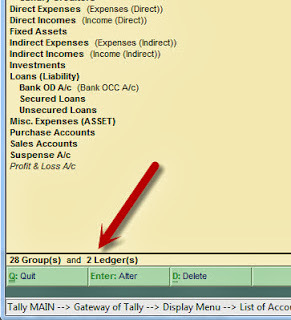 Now, go to the List of Accounts menu, total 18 ledgers should be there. 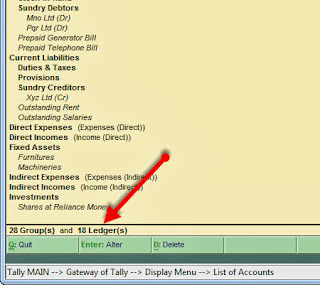 You can now check or alter ledgers from Gateway of Tally- Accounts Info- Ledgers- Alter. Same way you can Export Stock Items, Stock Units, Godowns etc and Import to a newly created company. Check out the following video guide on How to Import Export Tally Data from one company to another related to the above tutorial. So, you just learn to Import Export Tally Data from one company to another. Here we discussed only the Import Export Menu Option, in our next article, we will discuss how to Import Export Tally data directly from one company to another. Hope you like the above tutorial and the video guide. If you have any queries, you can contact with us any time using the comment form below. We’ll back to your query as soon as possible.